When the going gets rough, it’s time to call in the best Perth city cranes. Of all the crane hire companies in Perth offering slewing crane hire, you can count on Myaree for your rough terrain needs. This slewing crane works on sites with tight access and uneven ground. Tom Thumbs have a single cab, doubling up for both lifting and driving. Rugged and adaptable with multiple steering modes, the telescopic, hydraulic boom ensures you’ll get outstanding reach. If you need city cranes for residential purposes, Myaree has you covered with our pair of 12T Tadanos. If you need dual lifting, that’s no problem either. From a single heavy couch to an involved and ambitious project, get in touch and we’ll make it happen. Our city cranes are ideal for all aspects of construction work due to the rugged all-terrain nature of the Tom Thumb models. From lifting steel beams to windows, brick packs, and timber bundles, there’s no job too challenging for our highly skilled team. For your industrial needs, especially in cramped workshops, city cranes offer you remarkable manoeuvrability, not just heavy lifting. Here at Myaree, we’re marine specialists so get in touch today, and if our Tom Thumbs are not right for the boat or yacht lifting you have in mind, we’ll recommend a more appropriate crane. 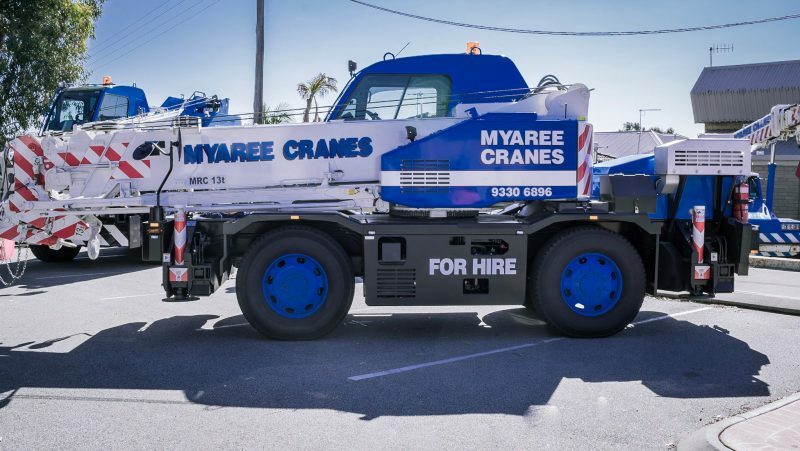 Here at Myaree Crane Hire, we’ve accumulated more than three decades of experience since we started out with two cranes back in 1984. Since we’re a family-owned and family-run company, you get the advantage of the personal touch while also benefiting from the resources of a large, buoyant company. It’s not just speed, performance, and outstanding end results you’ll get with Myaree. All work is conducted in compliance with OHSE regulations 1996. Operatives are fully licensed for all types of high-risk work. We look for ongoing relationships, but we’ll also happily help you with a one-off lifting job. Regardless of the challenges our drivers might face, they’ll get the job done quickly, safely, and precisely. For all your city crane, Franna crane, slewing crane, and dual lifting needs, we have the team, machinery and deep expertise to help you better than most crane hire companies from Perth.